The election results were not at all pre-determined. Katie promoted her years of activist experience and the past two years of hard work with Democratic leadership in the states and the DNC. Showing DPCA voters how she would get things done, Katie prevailed in the election for chair by a good margin. 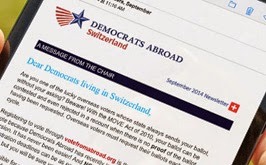 More details on the DPCA are available in The Democrat Abroad, May 2015 newsletter available at https://www.democratsabroad.org. The Global Primary is an important event for Democrats Abroad, participation is a factor in deciding the number of delegates representing Americans living abroad will be invited to the convention. We will be providing much more information on the subject leading up to Spring 2016. The meeting participants received inspirational speeches from Senator Cory Booker (NJ) and U.S. Ambassador to the D.R. James Brewster.